Ombré Powder Brows vs. Microblading? The biggest difference isn’t how it looks. When it comes to semi-permanent eyebrow tattoos, you’ve probably heard of microblading. With social media’s rapid growth in the last decade, microblading’s popularity in the US quickly surged, quickly replacing it’s passé predecessor, the traditional tattoo technique that left a generation of women with discolored blue, purple or green eyebrows. Microblading has seen mainstream appeal due its hyper-realistic effect created by hairlike strokes cut into the skin. So, why has ombré powder brow become the next big thing? LESS INVASIVE: Ombré powder brows are achieved using a small machine, which disperses extremely fine dots of pigments even into and across the skin in an airbrush or shading technique. Microblading uses a hand-tool that creates incisions or small cuts into the skin. Over time, repeated incisions into the same spots will cause trauma to the skin more quickly. 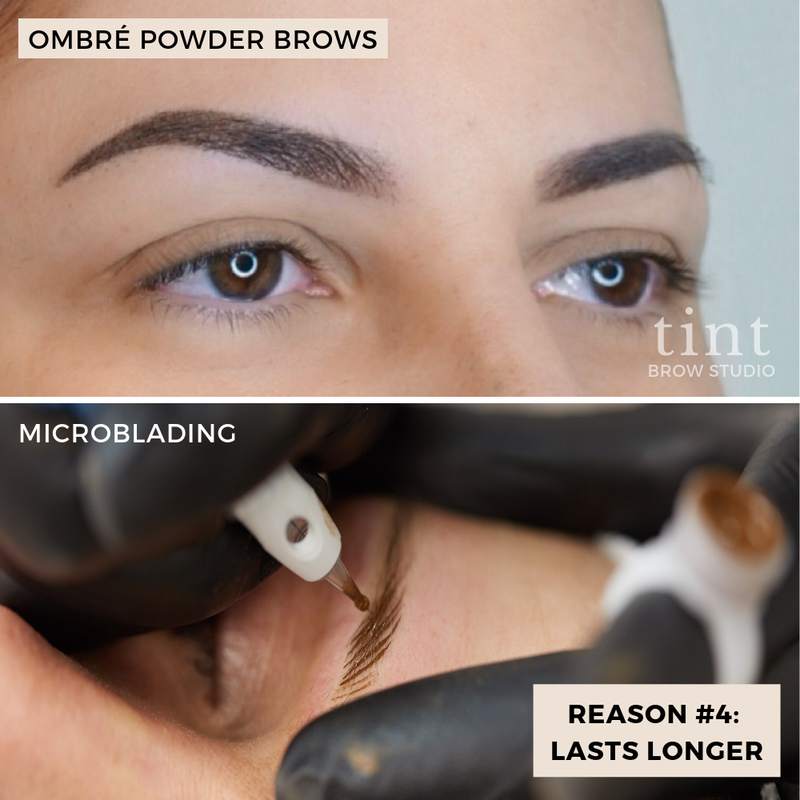 LESS PAIN & BLEEDING: Ombré powder brows are less painful due to the airbrush-like technique we apply, which creates less trauma to the skin vs. the blading technique of microblading. The latter also creates cuts into the skin, thus more bleeding is involved. With ombré powder brows, minimal to zero blood surfaces during the procedure. Some of our clients say that getting ombré powder brows is a similar sensation to an electric toothbrush pressed against the skin or rapid tweezing; some discomfort is to be expected as a needle is utilized. LASTS LONGER: Results do vary based on lifestyle, skin type, health, preferences, etc., but a single ombré powder brows session, using high-quality pigments, can last on average 2-3 years. Microblading, on the other hand, has a high likelihood of healing blotchy, spotty or with blurred strokes, thus requiring more frequent touch-ups, generating more long term wear and tear on the skin, eventually maxing out the skin’s lifetime capacity quickly. Like any injury to the skin, the body repairs the wounded area by building collagen fibers, creating a scar. Both treatments will eventually dull out the skin in this way permanently, so choosing the right method to save your skin integrity is critical. GREAT FOR ALL SKIN TYPES: Ombré powder brows are great for any skin type, unlike microblading, which is not suitable for those with oily skin. Microblading on oily skin requires several touch-ups, which causes more trauma to the skin. STILL LOOKS NATURAL: While ombré powder brows have a more “filled-in” look, the healed results appear like softly shaded brow pencil or powder. Immediately after the treatment, ombré powder brows can appear more saturated and bold, however, brows will fade 20-30%, leaving a very soft finish and shape that will allow our clients to quickly groom their brows going forward. A 2.5 hour (nearly painless) procedure will give your brows 1-3 years of life! We love this powdered look vs. microblading because it really looks like you've filled in your brows naturally with makeup. Waking up with gorgeous brows everyday can now be a reality.